Zion Market Research has published a new report titled “Thermal Energy Storage Market – by Technology (Sensible Heat Storage, Latent Heat Storage, and Thermo-chemical Storage), by Storage Material (Water, Molten Salt, Phase Change Material (PCM), and Others), and by End-Users (Commercial and Industrial, Utilities, and Residential): Global Industry Perspective, Comprehensive Analysis and Forecast, 2017 – 2024”. 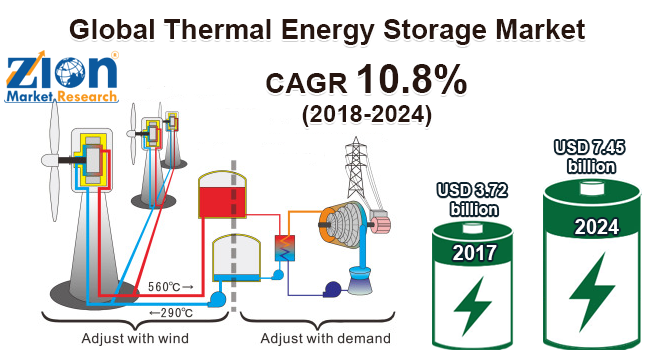 According to the report, global demand for thermal energy storage market was valued at approximately USD 3.72 billion in 2017 and is expected to generate revenue of around USD 7.45 billion by the end of 2024, growing at a CAGR of around 10.8% between 2018 and 2024. Increasing adoption of the renewable energy resources is the major factor driving the thermal energy storage market. In addition to this, the rapid industrialization across the globe has increased the need for continuous power supply which positively leads to the growth of the overall thermal energy storage market during the forecast period. Thermal energy storage technologies reduce the Green House Gas (GHG) emissions which will positively influence in increasing the demand of thermal energy storage market. Thermal energy storage is secured, clean, and user-friendly. TES is majorly used in the thermal power plants, concentrated solar power plants, and other energy storage applications. These factors are expected to drive the thermal energy storage market growth over the forecast period. However, lack of awareness of the storage technologies and high capital cost associated with the use of storage system is restraining the market growth. Based on technology, the thermal energy storage market is segmented into latent heat storage, sensible heat storage, and thermo-chemical storage. Sensible heat storage held major revenue share in 2017. The growth is attributed due to its number of applications in the residential and industrial sector. Sensible heat storage in both liquid and a solid medium is used in large-scale applications such as cooling systems and district heating. Increased usage of sensible heat storage in various applications is projected to drive the market during the forecast timeframe. On the basis of storage material, thermal energy storage market is categorized into molten salt, water, Phase Change Material (PCM), and others. The molten salt within storage material is anticipated to hold the largest market share during the forecast timeframe. Molten salts function as a large-scale thermal energy storage which helps in handling the fluctuations in weather; it is anticipated that the demand for the molten salt segment will increase during the forecast period. Based on end-users, the thermal energy storage market is segmented into commercial and industrial, utilities, and residential. The industrial sector is anticipated to remain dominant during the forecast period. This dominance is attributed due to the increasing adoption of the heating, ventilation, and air conditioning (HVAC) systems in the industrial sector, which positively propels the thermal energy storage market growth. North America held a major share in 2017; the trend is projected to continue over the forecast timeframe. This growth is attributed due to increasing demand for the renewable energy resources. Moreover, installations of concentrated solar power plants with thermal energy storage systems will boost the market growth in this region. Some of the major players operating in the thermal energy storage market are CALMAC, Solar Reserve, Chicago Bridge & Iron Company (CB&I), EVAPCO, Inc., Goss Engineering, Inc., Cristopia Energy Systems, Cryogel, Energy Storage Association, and Ice Energy. Industry players are mostly focusing on developing innovative technologies and merger and acquisition strategy to gain revenue share.